This is one of the rare posts on this blog that I will make without any photographs or snapshots, simply because they don’t exist. My toe was still inflamed and painful and the anti-inflammatory drugs I was taking were just barely taking the edge off. By this time, I really didn’t want to take photos as I was feeling so poorly. So, with dawn’s earliest hint I packed up camp and made my painful, slow way down the trail along Agate Creek. Generally, I am creating this blog to document and share the photos of my various adventures, but because this hike is still so fresh in my mind I want to write these few words to remind myself of the trek I undertook, even though the memories permeate with the shadows of pain felt at the time. Each step was a new adventure in painful sensations. I walked about five miles to get back to the trailhead, and was happy to get there. I had to work hard to ignore the throbbing joint, and I took time to notice the creek, the grass growing and the dispersal of light in the lodgepole pine forest. I rested at the old cabin on Burnt Timber Creek before making the final push to reach the trailhead. Crossing the creeks immersed the joint in cold water and helped with the swelling, but I was ever so happy to reach the trailhead and get in my car headed back to the relative comfort of home. Yet even upon reaching home the swelling never did go away with the anti-inflammatory drugs and I finally had to take a regimen of steroids to bring about relief. In the end, the gout brought my grandiose plans of backpacking to a premature close, but once recovered I was able to continue and enjoy the glories of a fine summer in the Rocky Mountains. Dawn arrived after a fitful night of attempted sleep; sleep which had been deprived due to the painful swelling that had accompanied a bout of gout. The morning was blue sky and warm sun, and as I didn’t feel like hiking or walking, I laid out in the warmth and soaked up the atmosphere of fresh, green grass and thick, pungent conifer forest. The shepherds were wanting to explore and romp about, and at times I indulged them their energetic outbursts, and what little we did was a challenge due to my lack of mobility. Oddly enough, the swelling of the joints caused by this form of arthritis isn’t much more painful when I’m moving about than when I’m sitting or lying about. Certainly, it does hurt to put more weight on the joint, but it felt good to move around from time to time. I had hoped that the gout would recede on its own assisted by the anti-inflammatory medication I was using, but those hopes were dashed as the day went on. By the afternoon, I had given up on taking photos and was just attempting to bear the pain. I see from one of these photos that I had the good forethought to bring along one of the dog’s toy balls and it was easy enough to keep them engaged with activity by tossing the ball here and there. The pain is bad but at least I was out in the woods; things wouldn’t have been better had I been at home suffering and here I could at least examine the stream flowing by in the meadow, gurgling and perky as the waters tumble and flow. The fresh forest smells and pleasant odors abounded, and made for some good feelings to help keep the pain at bay. I remember that as the afternoon wore on, the blue sky disappears behind an increasingly dense layer of cloud cover and eventually snow began to fall. Not much, but enough for me to seek some shelter. For most of the evening the sky was an ever changing mosaic of cloud and blue sky, with sun rays poking through the clouds. I went to bed as the sun set, hoping that the swelling would decrease on its own but most of the night was again spent in pain with only a few hours of fitful sleep. This portion of the Sawatch Range is perhaps better known for Monarch Pass, that gap in the mountains that allows transcontinental U.S. 50 to pass latitudinally from coast to coast. For me, on this date anyhow, the highway was relegated to being the trailhead from which I trekked to the high mountain meadows to spend a couple of nights under the stars. 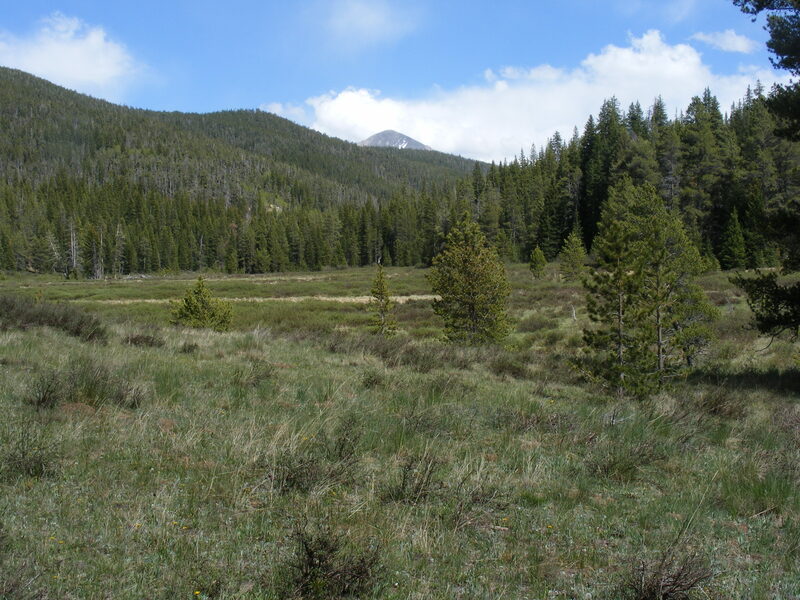 My goal had been to hike to one such meadow high up in the Agate Creek drainage; the waters of which flow from the crest of the Great Divide in the area south of the aforementioned pass. The eponymous named trail follows Agate Creek from near the base of the pass relative to U.S. 50, starting at an almost invisible trailhead. However, further up the pass two or three miles is another trailhead for a spur trail that descends some hundreds of feet in a half a mile to meet up with the main trail near the confluence of Agate Creek and its North Fork. This spur trail eliminates some half dozen or so creek crossings that can be hazardous during time of high water, such as mid-June is frequently. The spur trail is on a southern aspect and, as a consequence of receiving the full blast of the hot sun in the thin mountain atmosphere, is, although forested, quite dry. Upon descent from the trailhead adjacent to the highway, water is encountered at first the minor North Fork and then the major stem of Agate Creek. The creek must be forded at this point but the fords are not nearly as hazardous as those downstream. Here, the trail passes through a narrow defile of rock and forest before the first open valley is encountered. This valley allows a fine upstream view of meadows filled with willow and other marsh vegetation. The trail remains on the margins where the earth is above the marsh and dry ground carries passersby away from the inundated wetlands. Near Burnt Timber Creek is an old dilapidated cabin that is slowly caving in and decomposing back into its elemental components. There are numerous of these structures found throughout the National Forests; some where miner’s cabins while others were used by cowboys and others for administrative purposes. As modern times encroached upon the older methods of conducting business these cabins were abandoned for lack of use or funds for their upkeep. It is a shame that they couldn’t have been preserved to be used by the public on a rental basis but that would have been a bureaucratic nightmare to accomplish. The drainage had melted out from the winter’s snows for the first three miles or so of my hike along the trail, but by the time I had gone about a half a mile above the junction with Lime Creek Trail there was plenty of snow on the ground and water was running off from the forest keeping the ground soggy and wet. I was in the exact place I wanted to be and after a search found some dry-ish ground to pitch camp. Draco and Leah, the two faithful wonder shepherds, were exalted at the location and immediately, upon removal of their pack burden, began hopping around and sprinting to and fro. The nearby marshes were still brown and the first flowers of the year were beginning to bloom in this cold and wet habitat. Unfortunately, at this point, I had a severe attack of gouty arthritis in my left primary joint of the big toe; the most commonly affected joint for crystalline induced arthritis. This left me in deep pain that made sleep difficult and travel exceedingly challenging. My original intent had been to camp here and then climb to the summit of Mount Ouray in the morning. However, there was still enough snow remaining along the trail as it climbed through the forest to make hiking challenging even under the best of circumstances. So, instead of ambling about through the woods and meadows, exploring headwaters and seldom seen glens, I remained near camp vainly attempting to keep the pain at bay. 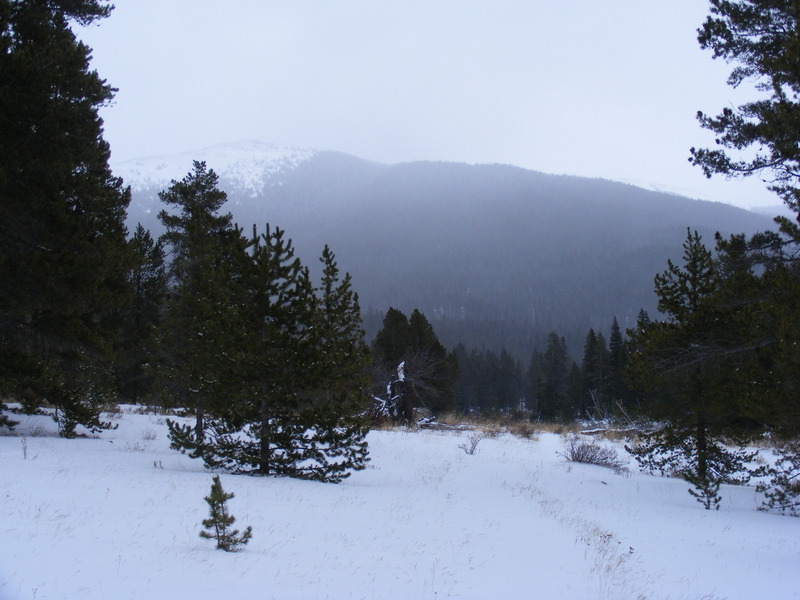 The time left me did allow for some close inspection of the forest and meadow near camp, but most of my time was spent watching the clouds speed by over the crest of the Continental Divide on their way east to the plains. So, not only was I in pain, but the clouds brought forth occasional spurts of snow. Yes, even in June the high mountains receive a final dousing of white crystalline frozen water. Not much, and to be sure what does come down will be melted quickly over the next day or two. But, in the end, this was one challenging backpacking trip – I wouldn’t meet the goals I had set out for myself, the pain, due to the gout, was nearly unbearable even with no weight bearing on the joint, and now it was cold, gusty and snowing. Yet, now, reliving the trip some many months later, I also remember the quietude and peacefulness of the surrounding forest; as time passed slowly and the snows melted almost imperceptibly. The meadow I found myself in was also sheltered from most the wind, and I could sit and watch the tree tops move around while only feeling the slightest breeze. Although, at times, my secluded camp would receive the full blast of the passing winds. Finally, night came around and I attempted to relieve the pain with the use of anti-inflammatory drugs to no avail. The pain kept me awake most of the night and I tossed and turned attempting to find comfort. Now that I have recounted that various tales that comprised my hiking season of 2008, my next goal is to put aside the further adventures had in 2009 in order to record my thoughts on the remainder of 2014 while they are still somewhat fresh. Another month or two won’t matter in my recollection of events happening in 2009; the memories are either still intact and won’t further much deteriorate or they are already turned to synaptic dust and it would thus be moot which I do first. The post I had last blogged about during 2014 was my overnight backpack trip to Spanish Creek soon after the actual events. My next antecedent journey was to visit the summit of Shavano Peak, the seventeenth highest peak in Colorado and one of the fabled Fourteen’ers. In late May I had attempted to summit Mount Shavano but had turned back due to persistent ice and snow piled deep and, as I didn’t have crampons nor an ice ax, I decided then that it would be prudent to turn back. Now, some three plus weeks after that first attempt, I was back at the trailhead across from the Angel of Shavano campground located in the glaciated valley of North Fork of the South Arkansas River. This trail is part of the larger Colorado Trail that goes through from the Platte Canyon to Durango. I thoroughly enjoy the first part of this hike as it climbs some five hundred feet from the trailhead to a small dividing ridge; the view of the valley where the trailhead lies is stunning – a fine example of past glaciation from previous ice ages. Now, the trail continues at a more or less level altitude excepting for small gullies and the like and passes through a heavy forest of aspen and conifers when not crossing green meadows filled with waist high grass and colorful flowers in the midst of efflorescence. The greens are the vibrant tone associated with new growth leaves during spring’s irruption. The sky is a deep blue that promises a warm day to come despite the puffy white clouds floating by idly. An hour’s effort brings me to the side trail that leads to the summit of Shavano Peak. From here it is nearly forty-five hundred feet in elevation gain to reach the summit. So, my real work is just beginning. At this point there is always some apprehension about undertaking such a physical and mental effort and I make a check of all systems as I stop to consume a small snack and imbibe water. The dogs, Leah and Draco, are with me, but they are of course oblivious to the coming adventure except that what they can read in my body language. It is certainly an large expenditure of energy to make this hike but the trail goes by quickly and the vegetation and life zones change often enough that I am engrossed in the wonder of the natural world. From the bright green of the montane forest we have passed into the sub-alpine and are surrounded by the dark green of the bristlecone pine and are also treated to the ever expanding views. Then we are out above the trees into the long gully above treeline and the trail passes through one of the wings of the Angel of Shavano made up from the lingering snow fields that will persist for another month or so. This area is a surprisingly vibrant garden of hardy flowers that loft wafts of perfumed odor to be set upon the breeze before dissipating; occasional drafts are concentrated beyond all expectation and the result is pure ecstasy upon the olfactory senses. Map in hand, I am experiencing rapturous joy at the wildly variegated topography. I am hastily stuffing my mouth with the victuals I brought and the dogs are doing the same as I also mentally ingest the direction and distance to the various peaks and drainages that are so visible in all aspects of the compass. The rock itself is striking and feels primeval, perhaps because it has been heaved up from the earth’s core. Life has a tenacious grasp and where a few pockets of soil accumulate there emerges growth; even on the bare rock face are the mosses and lichens that begin to decompose the granite into smaller fractions usable by more species. After all this and some peaceful repose that may be called meditation, the canines and I descend down to the saddle where we take another shorter rest in a field of alpine daisies. The dogs lie out on a snow field and keep cool and hydrated. I gaze at the summit and say goodbye for now; we move on down the trail not terribly menaced by thunderheads. Soon, treeline is reached and we share the bristlecone forest with the Clark’s nutcrackers whose shrill whistle is a persistent accompaniment. These corvids make a living from the numerous pine seeds produced by this and other species of pine throughout the higher elevations. The trail is steep and rocky at places and sometimes the rounded cobbles are a nuisance to pass through but all in all the hike goes especially well and the bright greens greet upon our return to the montane aspen forests. As there is no hurry to return to the trailhead the dogs and I pass slowly down the trail and I take time to literally and figuratively smell the flowers. Then we reach the final crest that leads us down to the trailhead and the termination of the day’s adventure. The view of the valley again bedazzles the senses and I feel gratitude at being able to spend a day in mountains. How blessed I am to be living in the Rocky Mountains! The dogs are just beginning to show signs of slowing down, but the are hopping around on the final descent and my stride is fast and steady as all fatigue is easily ignored with the realization that the end is in sight. What a fine day! From the summit of Mount Shavano looking north. Is this real? Well, I have gone and done it again. These photos seem so familiar yet their location eludes me. I’m sure they are within the area commonly referred to as the Gunnison Country, but where exactly I can’t tell. I’m hiking in early December and there hadn’t been enough snow fallen on the ground to obliterate the trail; the trail is a bit obscured but is still visible. The location must have been from about nine to ten thousand feet in elevation judging from the forest cover and type. 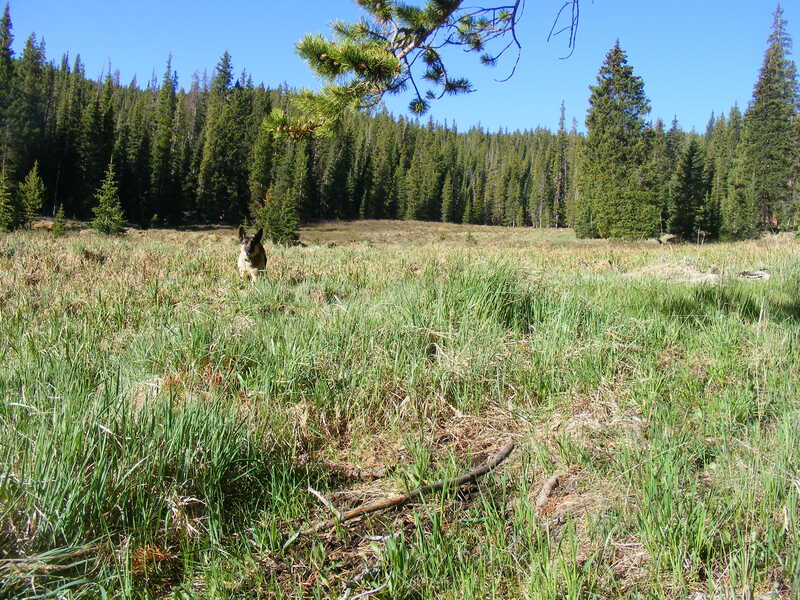 There is a big open meadow somewhere along the trail. Regardless, it looks like a fine way to spend a late autumn day. Apparently this was the last set of snapshots that I took for the year 2008. As usual with this year and all others the amount of country and diversity of habitat I saw and experienced was awe inspiring. Even though the mountains of Colorado sadly do not have wolves, grizzly bears and free roaming buffalo, there is still an amazing array of life present. From the tall peaks to the deep valleys and all the places in between, I was truly blessed to have been able to commune with nature and experience first hand the soothing tranquility found when nature is able to move at her pace. I love being able to hike and ski year around and be a firsthand witness to the passing of seasons at these lofty locales. Maybe, someday, I’ll be hiking along this same trail and realize that it is the same as the mysterious location and I can revisit this blog entry and edit it appropriately. Edit: I now believe that this is probably Agate Creek above the North Fork and in the vicinity of Burnt Timber Creek. I don’t know which trailhead, the upper or lower along U.S. 50, I would have used to hike to this area. There are so many Willow Creeks throughout Colorado that it would be pointless to not mention more specifically where this particular one is. In fact, within Gunnison County alone there are a half dozen or more creeks so named. This Willow Creek empties itself into, depending on the water level, Blue Mesa Reservoir or Gunnison River just below the Gunnison River Canyon west of the City of Gunnison. Willow Creek drains the north side of Huntsmen Mesa. This area is little explored by myself mostly due to the confusing patchwork of public and private lands as well as the lack of decent maps that delineate the boundaries and routes in the area. So, despite its relatively close proximity to my home, this area has remained mostly unexplored. 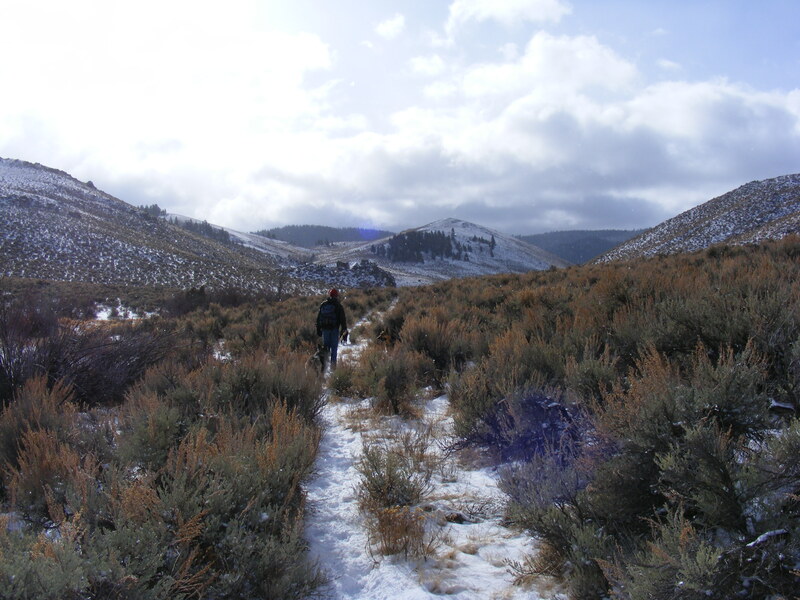 This day, however, I did a bit of exploring on the above mentioned creek and wandered about the vast sagebrush sea that comprises most of this area. Along the creeks there are groves of cottonwood and other deciduous trees and as elevation increases there are increasingly large groves of conifers, mostly Douglas firs, clinging to the north face where most of the snow and subsequent moisture is found. I wandered through some meadows of grass and found an old homestead that had been built up against a large rock sitting in the middle of one such meadow. There wasn’t much left of this homestead except for the fireplace and chimney built of river stone. It must have been a challenging life to make a meager living out here in this harsh, dry and cold climate. It is no wonder that this location was abandoned. I don’t have any real strong memories of this hike; it is almost as if this area really wants to be left alone and forgotten by the rest of the world. It is forlorn, and this day, with the clouds and chill wind, it felt as though even the ghosts would be in a hurry to move on to another location. One of my favorite areas near my home in Gunnison, Colorado is Taylor Canyon which is located about ten to thirty miles, consecutively, above the city. It is a classic mountain canyon with steep rock walls of weathered granite and adorned with thick forests of spruce and Douglas fir. Fishermen and rafters love the water, and hikers like myself enjoy the many trailheads and opportunities for solitude. One of these trails is the Summerville Trail, a narrow footpath that follows Summerville Creek from the trailhead and leads into the northern portion of the Fossil Ridge Wilderness. After a mile and a half, the trail passes over a small, negligible divide and falls into a tributary of Crystal Creek, itself a much larger tributary of the Taylor River. 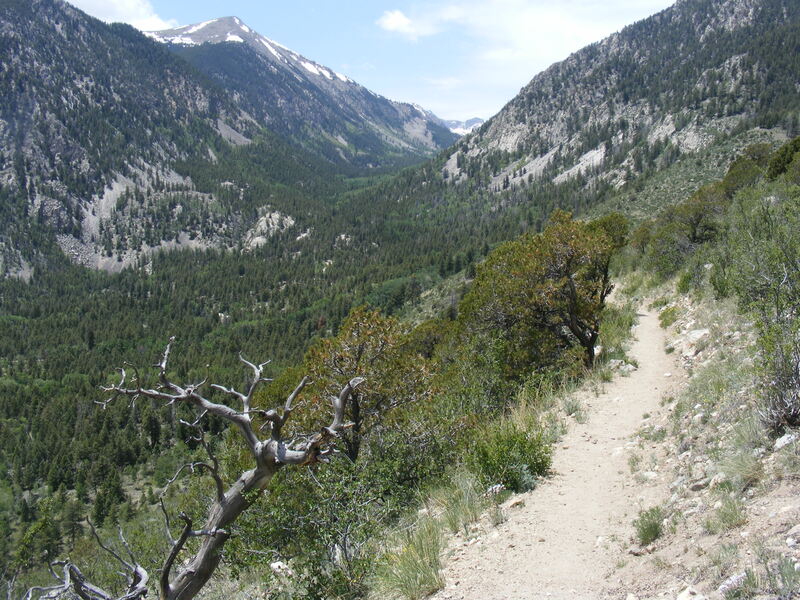 The trail goes all the way to the highest skyline of Fossil Ridge, a distance of twelve miles. On this day, I only hiked up the first two or three miles before I rested and turned around. I’m not sure if this was my first hike on this trail, perhaps it was my second. Regardless, this area is mostly a thick forest of lodgepole pine with dimimutive Summerville Creek trickling through it. The trail repeatedly crosses the creek, but there is no real effort to making any of the crossings; at least during the autumn, when the waters are low. During spring, the crossing may be a bit more challenging, but shouldn’t stop a determined hiker. Looking at the photographs, I see that we, Sheba, Lady Dog and I, stopped at a rocky outcropping that provided a view back across the canyon to the southern face. We were hiking on the north face, and some of the recent snow remained clinging to the forest floor. I’m not sure, but I’m guessing that we passed over the small divide and crossed into an unnamed tributary of Crystal Creek. 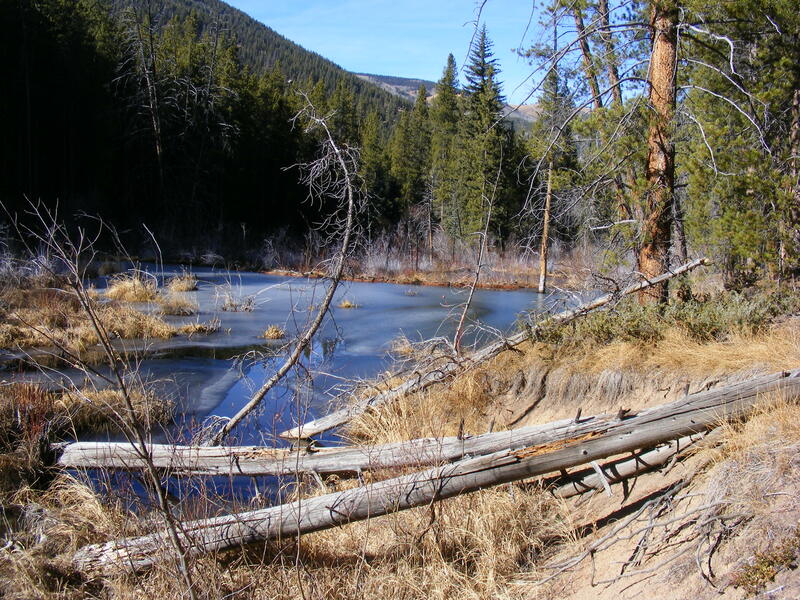 I vaguely remember descending from a small ridge and getting into a small creek bottom were the dogs were happy to slurp up some water and the aspens stood silently, leafless in their preparation for the long winter. What I remember most from this hike was how thick the forest was, one lodgepole after another, acre after acre. This is a trail that I should revisit, especially in the spring when the pasqueflowers are blooming.